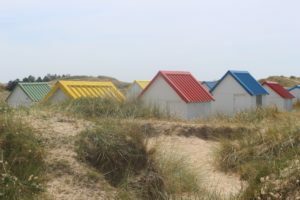 What I love about Normandy is a rather long list! So I though I’d focus on just one of the things I love: the Normandy coastline. Coastal towns and villages, harbours, sandy beaches, fantastic sunrises and sunsets, beach huts and seafood are just some of the highlights. Granville is one of my favourite coastal towns. It’s set on a rocky promontory and has two distinct parts. The harbour is a wonderful spot for people watching as boats and their passengers come and go. You can catch a boat to the nearby Chaussey islands and the Channel Islands from here. Rue du Port overlooks the port and has a wide variety of seafood restaurants. Small independent shops, a market and the usual facilities and business are in the streets immediately beyond the port. The lower town contrasts with the high town. Part of the town is fortified and you can walk round the coastal path for great views up and down the coast. It’s a great spot for rock pooling. All you need is an outgoing tide, a net, bucket and some inquisitive children. The photos below were taken at Mont-Saint-Michel bay. It is possible to walk across the bay when the tide is out as long as you join a guided tour. There’s a danger of quicksand otherwise. Seafood features heavily on Normandy restaurant menus. You can be guaranteed fresh produce as it will have been caught locally. There are oyster and mussel beds located from Agon-Coutainville up to Gouville. 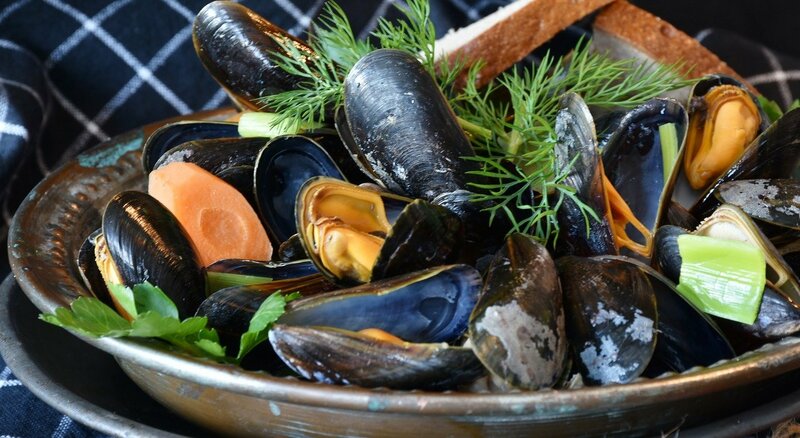 My favourite seafood dish is moules frites which is mussels and chips. I love these beach huts at Gouville-sur-Mer nestled in the dunes. Their coloured roofs add a pop of colour to the landscape. The extreme tides are an unusual characteristic of the Normandy coast. The photo below was taken at Les Salines, near to Bricqueville sur Mer. The whole road floods during very high tides. 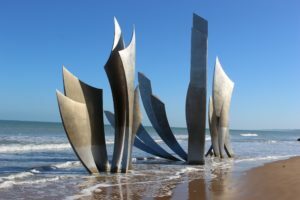 An article about the coastline wouldn’t be complete without mentioning the D-Day landing beaches. You can read more about the beaches here. 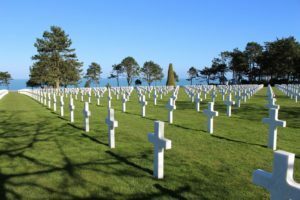 The day I spent exploring the Omaha Beach area last year is one of my personal highlights. It was an incredibly emotional day as I learnt about the bravery and horror that so many soldiers experienced on 6th June. 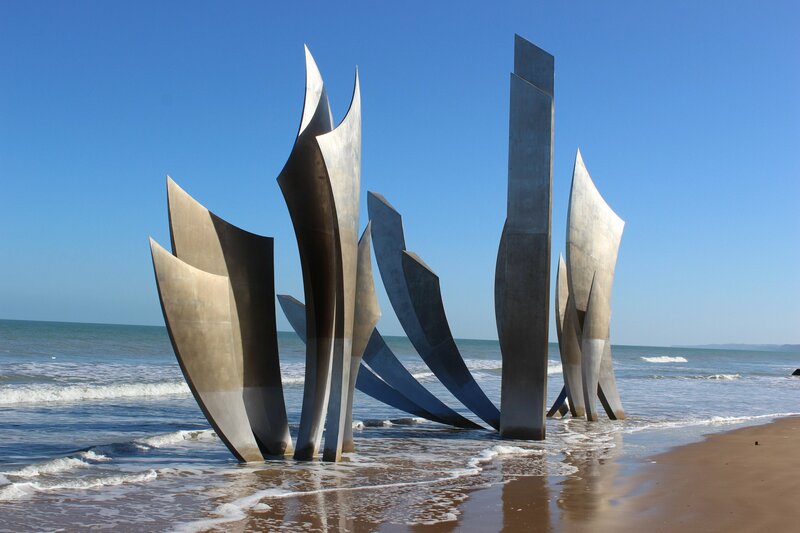 This is Les Braves sculpture on Omaha Beach at St Laurent sur Mer. It’s hauntingly beautiful and represents the sacrifices made on this beach. My personal reflection was that it symbolised the fallen who didn’t make it but who nevertheless played a vital role. 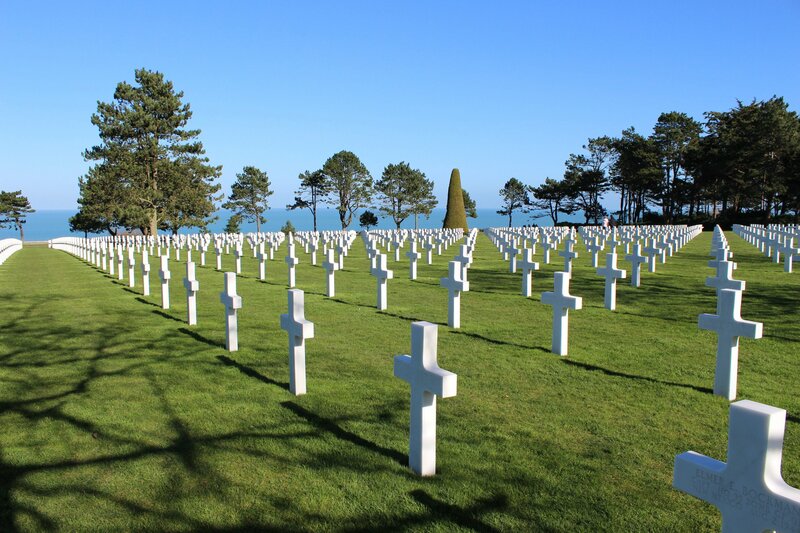 This is the American Cemetery at Colleville sur Mer. It overlooks the sea and you can hear the gentle rumble of the waves as you walk along the northern edge of the cemetery. 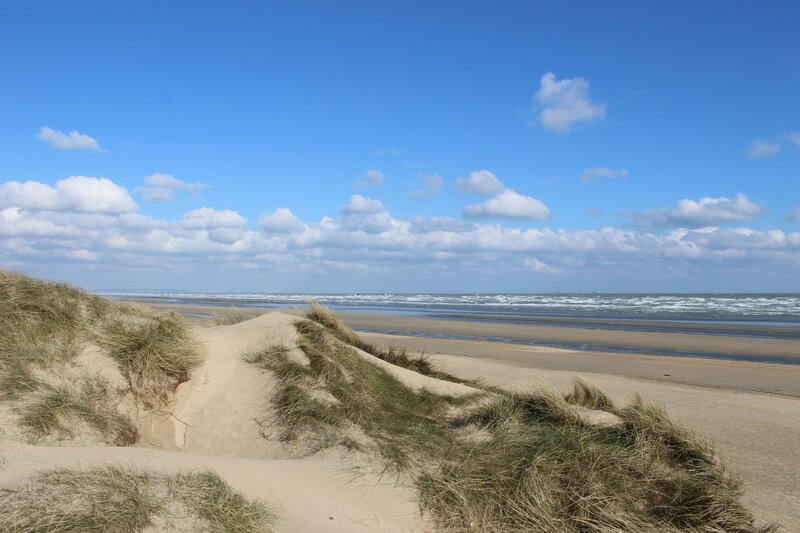 And finally, Utah beach. The beach was the landing place of American troops. 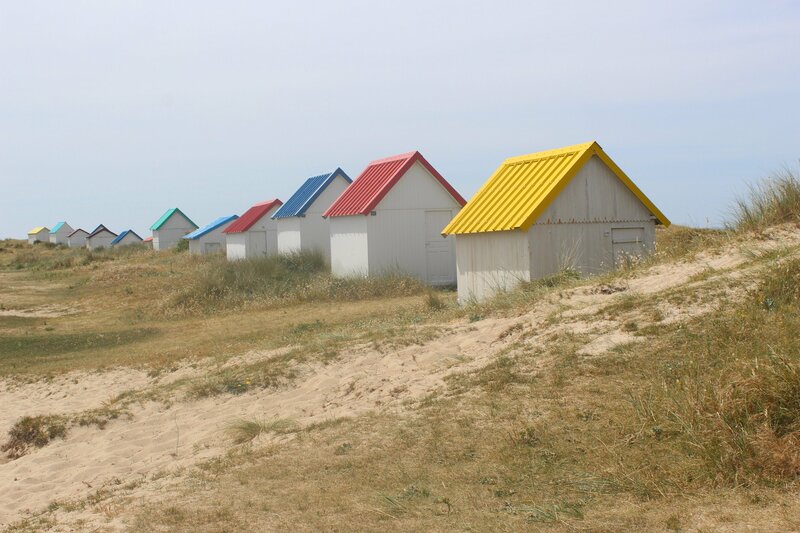 There are lots more things to do and do along the Normandy coastline. I live around a 15 – 20 minute drive from the nearest beach. A trip to the beach always lifts the spirits and blows away the cobwebs. It’s good for the soul and one of the things I love about Normandy.